INVEST in your community. INVEST in arts education. INVEST in high-quality performances. WHY BECOME A BUSINESS SPONSOR? Each season the Symphony entertains a well-educated, affluent audience of over 10,000 patrons, including families with school-aged children. 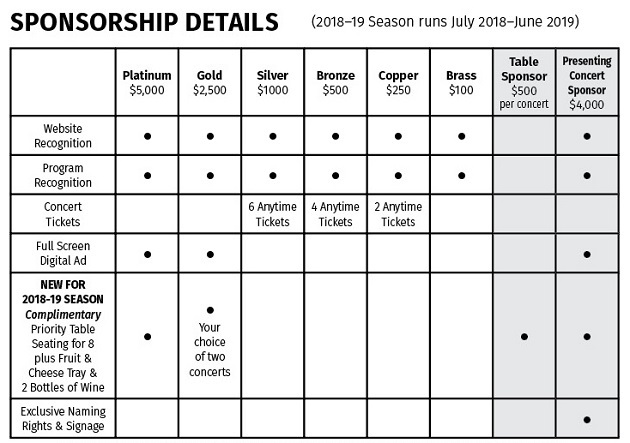 In return you will reach loyal supporters of both the Symphony and its business sponsors, gain recognition and support through our website, concert programs, social media accounts and more. Questions about our Business Sponsorship program? Call the Symphony office at (816) 401-5251.